We won’t bore you with the typical overview that speaks to the imminent arrival of BYOD and the advent of employeeowned devices on the corporate network. 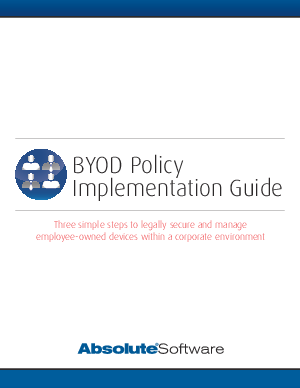 If you’re reading this document, you know that BYOD isn’t coming, it’s already here. The purpose of this guide is to provide practical, concrete steps that allow you to efficiently incorporate employee-owned devices into your deployment while securing and protecting corporate infrastructure and data.